Yes, I am writing and starring in a children’s book! 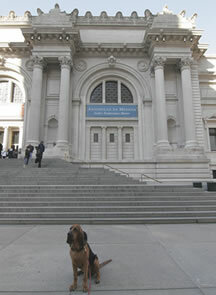 It is called “Wimsey’s Guide to New York” and it features me as a bloodhound about town showing off my favorite city. My companions in this endeavor are two humans, Elizabeth and Jay, and, of course, both are red headed in honor of me. Elizabeth escorts me to various locations that would be of interest to young tourists and Jay photographs me as I explain the site to the readers. Elizabeth writes down what I have to say and puts it into her computer and we review the text together (although I am tall enough to see the computer screen, I like to stand on her lap so I don’t miss a word). Elizabeth says she wrangles me, but I think I wrangle her. Working on the book is such a lot of fun and I get to meet so many new people who stop by our shoots to say hello, take their own pictures and of course, admire me. My shoot in Grand Central Station was even filmed for CBS News when they did a story about me going to Westminster. Jay is a heck of a fellow and I always like to follow him around and look into his camera. He does tend to complain a bit when some of my drool (it helps bring up the intensity of the scent when I am on the trail of something, which is pretty much all the time) gets on his lens, but I know this is only because it ruined an exceptionally beautiful shot of me. And Jay is not the only media professional who finds me alluring. I have also been filmed as part of Anna Pizzaro’s upcoming new documentary on Urban Pets. Can’t wait to see how that turns out sometime next year. (If you see it just remember that when Elizabeth was being interviewed I was amusing myself by gnawing on her TV table! It made a nice change from my rawhides). Well, that’s my life so far. Gotta get back to work! My public awaits. PS: I am also known as His Houndship or The Great Hound, which as the largest of the scent hounds, I like to believe this is true both literally and figuratively.